Wellcome are inviting applications to their July round of public engagement funding. You can apply for £25,000 to £250,000, although occasionally grants are made for up to £3 million. Contact Wellcome with any questions about eligibility or the application process. If you would like advice on planning an activity or submitting your application, contact Adam Morris (Engagement Officer). ‘Curiosity’ provides funding for organisations who want to run exciting and engaging science activities aimed at disadvantaged children and young people. Working and thinking in scientific ways can help them gain confidence and develop life skills, and spark their curiosity in science. It is a partnership between BBC Children in Need and Wellcome. Up to £10,000 a year for a small award. Up to £40,000 a year for a large award. If you have any questions, please contact BBC Children in Need. If you would like advice on planning an activity or submitting your application, contact Adam Morris (Engagement Officer). 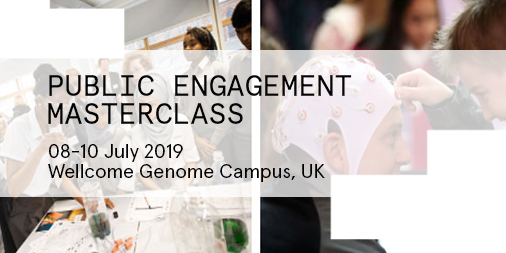 Applications are now invited for a Public Engagement Masterclass being held 08-10 July 2019, at the Wellcome Genome Campus, UK. Designed to support researchers from all disciplines who aspire to be research leaders in their fields, this course will provide the tools to help establish a reputation for quality and embedded public engagement in the context of a research portfolio. Researchers receiving funding from Wellcome, UKRI, Royal Society or European schemes may be eligible for bursaries or funding. All application and bursary requests MUST be received by 16 April.